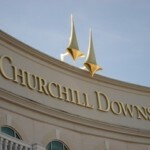 LOUISVILLE, Ky. — For this reporter, his first one lasted almost five years, which is 1,824 days, 23 hours and 58 minutes longer than usual for the Kentucky Derby. Without fail, the Derby is a two-minute exercise, more or less.The 1968 Derby was such a strange introduction to 30 years of watching the race. There has never been another Derby that compares for drama, intrigue, confusion and just plain longevity. Dancer’s Image beat Forward Pass by 1 1/2 lengths–fair and square, everybody thought, until a state chemist found a dose of an illegal anti-inflammatory agent in the winner’s system. Phenylbutazone–bute–is now acceptable nationwide, and went legal in Kentucky in 1974, but it was too late for Peter Fuller, the beleaguered owner of Dancer’s Image, who was disqualified after the positive test came back. 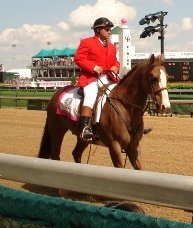 Alex Harthill, veterinarian to the Derby stars, was somehow implicated, and paid a $500 fine for what was called “improper conduct.” A couple of days after the post-race test hit the fan, Harthill gave me a ride through the tunnel at Churchill Downs, under the infield and over to the backside. I wrote a story but the sports editor at the Louisville Times was not impressed. I think he waited until most of the staff was in the office before he ceremoniously sailed the story into a wastebasket. “I can get garbage like that at the corner drugstore,” he said. Later in the day, his boss, the editor of the paper, a former science editor, came into the department and asked if anybody had looked into how Dancer’s Image got the bute. “I’ll get somebody on it,” the sports editor said. When the editor of the paper was out of sight, the sports editor approached my desk, where I was trying to handle rejection gracefully. “Got a dupe of that story?” he sheepishly asked. A bute dupe? Happy to please, I triumphantly opened the drawer. Churchill Downs security took a beating because of Fuller’s charge that somebody got to his horse. Security is better now, of course, although I once infiltrated the ranks. Gen. Norman Schwartzkopf, fresh from his epic tour in the Persian Gulf, was a guest at the 1991 Derby and the grand marshal for Louisville’s Pegasus Parade. My routine immediately after the Derby is to hotfoot it from the press box to the jockeys’ room–four flights down–and then, after the interviews, back upstairs to write the stories. 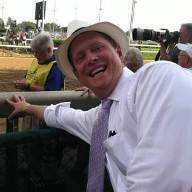 In 1991, returning to the press box, I stepped out of a door to a tunnel just as Schwartzkopf, Churchill Downs president Tom Meeker and their entourage were leaving the infield and returning to their seats. Schwartzkopf and Meeker were surrounded by security, but suddenly there I was, accidentally in step with the authorities. In a distant box seat, some friends recognized Schwartzkopf and started snapping away as we disappeared through the tunnel. They didn’t realize I was just behind the general. Back home in Florida, their film was developed. They wondered if that was a look-alike for someone from The Times, posing as a would-be military assassin. The same look-alike has been involved in two pickpocket incidents at Churchill Downs. Has there ever, in Derby history, been someone who was both accused of being a pickpocket, then also been pickpocketed? In the early 1980s, waiting for a friend at a track turnstile, I bumped a man who was coming through. A 6-foot-5 man, I should add. I said, “Excuse me,” and walked away, but he grabbed me from behind, by the shoulder, and spun me around. Recognizing the mismatch, I issued a soft denial. I was working for a national trade group at the time, an organization partly responsible for security at Churchill Downs. Flashing by, in a window of the mind, was an image of me being hauled in as a suspect, getting questioned by my co-workers. Waving both arms frantically, Mr. 6-foot-5 continued to demand his wallet. In one of his hands, all the time, was the wallet. He apologized profusely. For a while there, I was nearly convinced that I really had filched it. In 1991, the Schwartzkopf year, Strike The Gold outfinished Best Pal before 135,000 and there was a horrible crush along the route that takes us to the jockeys’ room. Trainers of Derby horses were having trouble getting through. In particular, Ian Jory, the trainer of Best Pal, seemed to be blocked from getting to his horse. I was caught in the melee. Several of us almost went down, with the prospect that we would be trampled by the crowd. I didn’t fall and I wasn’t trampled, but by the time I got back to the press box, my wallet was gone. I didn’t think it was Schwartzkopf. I was forced to admire the culprit’s workmanship: I was wearing a full-length raincoat, fully buttoned, and he was still able to invade my pants pocket. Another time I had my wallet but I still had a bad case of the shorts. It was 1978, the year Laz Barrera would sweep the Triple Crown with Affirmed. Early on Derby day, the Cuban trainer was in the Churchill Downs front office, dispensing wisecracks. I arrived in need of approval for a check that needed cashing. 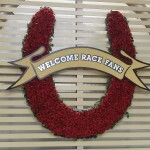 Thanks to the many parties, money is frequently not an issue during Derby week. For the tapped-out horseplayer, these soirees are oases in the desert. The most hoity-toity are at Anita Madden’s and Patricia Barnstable Brown’s, but one of the best was the least pretentious, thrown by Legs and Ruby Mancuso in an upstairs apartment above a heating and air-conditioning firm across the street from the track. From the Mancusos’ front porch, you look directly down on the quarter pole at Churchill. Now that is Derby atmosphere: The moon and the quarter pole, less than 24 hours before the race. Legs Mancuso was a mountain of a man, weighing almost 400 pounds. He knew his way around a horse and was aptly named, having rubbed the legs of horses for Henry Forrest. A trainer with a perfect record in the Derby, Forrest won here in 1966 with Kauai King and repeated in 1968 with Forward Pass, after the disqualification of Dancer’s Image. One year at his party, Mancuso seemed comparatively svelte. “Lost some weight, Legs?” I asked. The things you remember most about the Derby are the stories that got away, the scoops that didn’t happen. None could have been bigger than A.P. Indy’s last-minute scratch in 1992. The news didn’t break until the morning of the race, but I’ll always feel that I should have had the story two days before. I spent the next 48 hours trying to run down the report. Pat had promised her informant that she wouldn’t pass on the story, not even to me. “Was it a bartender or an assistant trainer?” I asked at one point. Source credibility was an issue. All I got was silence. Several hours before the race I learned, along with about 1,000 other media types, that A.P. Indy, the Santa Anita Derby winner, was out of the race. Days later, I told Dave Feldman, a colleague from Chicago, about missing the story. “What would you have done if your wife had done that?” I asked. “I would have punched her in the mouth,” Feldman said.